This Canadian Thanksgiving, I propose a toast to my dedicated readers, Twitter followers, Facebook friends and fans who have kept up with my blog since its inception in 2007 - five years come November! That calls for a big ol' wine wOOt! 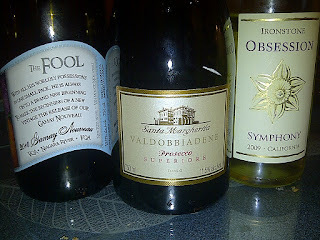 Santa Margherita Valdobbiadene Prosecco Superiore (Italy) from last Christmas, plentiful on bubbles, with just the slightest hint of off-dryness, a smidge of yeast and lots of tropical fruit. Rief's The Fool 2010 Gamay Nouveau (Niagara), which is now almost a year old and still tasting like it just got pressed. Beautiful violets, lush red berries and a bit of a candied streak running through it. Best with the dark meat. Ironstone Obsession Symphony 2009 (California), showing slight differences from the previous vintage in terms of flavour: a bit more minerality and sharper acidity this time around. But it still goes great with ... well, pretty much everything. I even had a back-up bottle on hand: Inniskillin East-West Series 2010 Chardonnay, bought totally on impulse from the Wine Rack at the grocery store. Because it's made from fruit grown in both Ontario and British Columbia, it doesn't qualify for VQA status (something I actually had to explain to one of the cute - but rather clueless - young sellers at the store. Don't they teach these kids anything?) Kept a bit too cold, it still made for an easy-going, pleasant quaff, not too super-buttery, with a healthy dose of tart apple acidity and a clean finish, likely very good with turkey. By the time we got through the other bottles, though, the tryptophan coma had set in (yeah, THAT'S what it was ...) so we opted to save this one for another day. Joyous Gobbling, my dear friends!